Thanksgiving is coming soon and of course Turkey is on the menu for our family! So I thought I’d try out a Coffee Rub I created and have my sister and her family over to try it out with an early turkey dinner. Needless to say, it turned out to be a huge success. 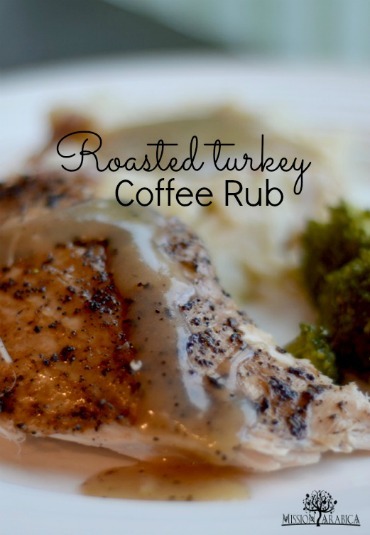 As coffee typically does with meat, the flavor of the meat itself was enhanced nicely without getting too much “coffee taste” when eating the turkey. The coffee also added a very robust flavor to the gravy. So I think it’s safe to say this would be a unique and super yummy way to put a twist on your traditional holiday meal that’s sure to get praises all around! Tell us what you think of it when you try it! First of all, we used a 10 lb turkey which fed 4 adults and a couple kids. Most of us had seconds and there was leftovers! If you are wondering how big of a turkey to get, Butterball has a great calculator tool to help you know how big your turkey should be depending on how many people you are feeding, how much you want in leftovers, etc. If you have a really large crowd and will be using a bigger turkey, just double the rub recipe and you should have plenty! So, to get started, preheat the oven to 450 degrees F, take the turkey out of the refrigerator, remove any packaging and giblets, set the turkey breast side up in your roasting pan, and let it sit for about a half hour to take the chill off. I also toweled it off to dry out the skin, giving it more of a crispness when it cooks. Also, I chose not to brine the turkey (which is soaking it in salted water for several hours or other spices to flavor the skin). Some people like to do this, but I felt that the rub was enough to flavor the meat nicely. While the turkey dries out, grind the coffee (we used Mission Arabica Costa Rica coffee) and then mix all the rub ingredients together in a small bowl. Before rubbing the turkey, baste the turkey with the olive oil using a basting brush. Then rub the turkey with the coffee rub mixture. Pour 2 cups of broth or water into the roasting pan. (I just used water.) Cover and place in the oven. Reduce the oven temp to 350 degrees F.
I basted the turkey with the juices in the pan after the 1 hour mark, which also helps crisp the skin. We cooked ours for about 2 hours and it turned out really well. I've read that the general rule of thumb for roasting a turkey is 13 minutes per pound of turkey, however it does make a difference whether you stuff the turkey and whether you cover the pan or not. We chose not to stuff the turkey, but rather placed two halves of a lemon and a couple garlic cloves in the cavity. You don't even really have to put anything in the cavity though if you don't want to. All in all, the internal meat temperature should reach 165 degrees in the thigh meat with a meat thermometer before it is considered done. I also bought a turkey that had a pop-up timer which made it super easy! Take the turkey out of the oven and place on a platter. Cover with foil and allow it to rest while making the gravy. To make the gravy, bring the turkey juices from the roasting pan to a boil in a medium sized saucepan on the stove. Mix 2-3 tablespoons of flour or corn starch in about a half cup of VERY COLD water. Whisk the flour mixture into the boiling juices until thickened. If it seems too runny, add a bit more flour or corn starch until it reaches the consistency you like. Plate and serve! We served ours with broccoli and mashed potatoes. I’m not great at carving turkey by the way. But if you want a good tutorial on that, check out this youtube video from Alton Brown of Food Network. He does a really nice job of showing you how to carve the turkey nicely.